The Scariest Day Ever: A Twin Birth Story : The Baby Project After Andrea Pike gave birth to her daughter Natalie, she had to get a C-section for Elizabeth. And that's when things took a frightening turn. Andrea and Jeff Pike before they went into the operating room — and well before Jeff was kicked out and Andrea's life was on the line. Andrea Pike gave birth to her twin girls on Aug. 3 during what she called a "terrifying week." Since then, we have been waiting for her birth story, and she said in an email that it was ultimately very hard to write. Here, Andrea tells the story, up until the moment she blacked out. Her husband, Jeff Pike, will fill in the blanks in a post later today. "Honey, it's time. My water broke." Even though the words jolted him out of his sleep, he smiled at me when he wrapped his ears around what I'd just said. For the next 30 to 40 minutes we moved around the house like a silent, drowsy hurricane; re-packing the hospital bag, texting and calling his mom and Barb, my best friend, to see if either one of them were awake enough to take our two boys for the night. Before I waddled out of the house that morning, I looked around and took mental photographs of everything, knowing the house would never be the same the next time I saw it. As we drove to the hospital after dropping the boys off with Barb, I noticed lightning in the far-off distance. It made me happy to think that my girls would be born after our little corner of the world got a much-needed rain shower. We checked into triage once again (I'd been there twice before with preterm and false labor). This time, after a test to make sure that it really was my water that had broken, we were admitted. The sky outside my hospital room gave a great show of lightning and rain, and as the sky tried to turn the color of morning, the storm kept raging on. After a few hours and contractions of very little "oomph" passed, my doctor recommended that we start Pitocin to get the show moving. She also suggested that I get an epidural. Now, I've never been against epidurals and had always joked that I wanted one as soon as I hit my third trimester, but in the past few weeks, I had sort of changed my mind and wanted to see how long I could go without getting one. This change of heart was quickly ditched after my doctor said that it was more out of precaution than comfort. If I was able to deliver Natalie vaginally, and then, for some reason, needed to have a C-section to deliver Elizabeth, every minute counted, and the epidural would already be in and working. I agreed, and they said that when I felt the Pitocin starting to do its stuff to let them know, and they'd call in the anesthesiologist. It wasn't more than 20 minutes after the Pitocin started dripping into my veins that I was feeling very strong contractions and was trying to go to my "happy place." The epidural was in minutes later and about 15 minutes after that, I was swimming in Hanalei Bay. Everything after that seemed to zip by at breakneck pace. I remember updating my Facebook status via my cell phone, I remember sweet conversations with my husband, and I remember that it was "Mob Week" on AMC and that The Godfather was on. And yes, we quoted (rather, made up our own hybrid quotes) the movie with our own twists like, "Take the baby, leave the canoli," and, "May your third and fourth children be not-so-masculine children." The next thing I remember, I was being checked for dilation and the nurse telling me I was "10 and complete." I was giddy. Jeff was handed a bag of clean scrubs, and when he was dressed, he fished out of the hospital bag the University of Louisville scrub cap that I bought for him especially for this occasion. 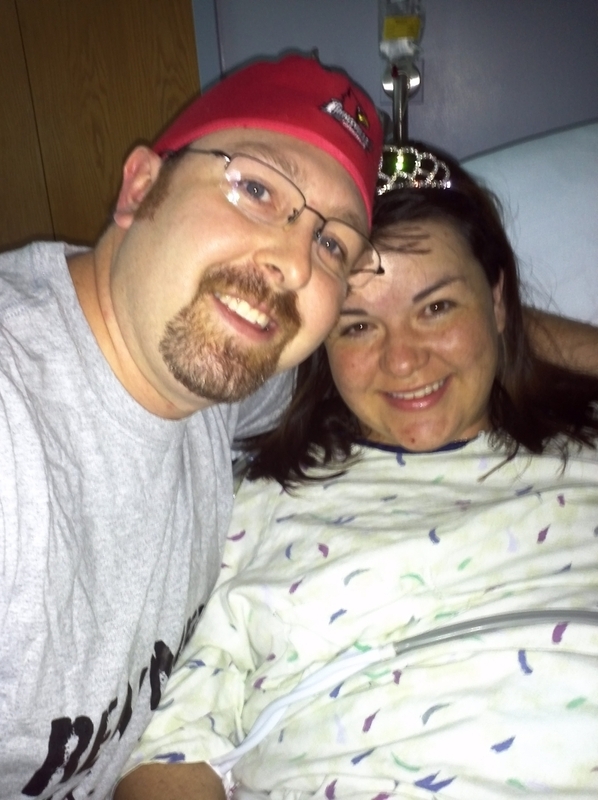 I asked him for my tiara (I don't remember if it was a dare or something I just thought I'd do, but a few weeks back I'd announced on Facebook that I would wear a tiara while I gave birth) and then took a picture of us, just minutes before I was wheeled back into the operating room. And then I heard the words I had been wanting to hear for as long as I can remember: "OK, you can start to push." My sweet Jeffrey was to my left, cradling my head in his right arm and telling me that I could do it, and what a great job I was doing. His words were like a warm bath that soothed every part of me. I could feel Natalie's head budge a little, every time I pushed. After what seemed to be no longer than 15 minutes (which I later learned was closer to 90), I saw nurses opening packages of tiny nasal aspirators and tubes. One nurse opened a package with a blue paper sheet and laid it across my chest. "What's that for?" I wheezed, just having come off of a three-round push. "Really? She's almost out?" I cried. "Yup, she's almost here!" she said, her eyes smiling. The next thing I remember is feeling something slippery and warm, a tiny bit of squirming, more slippery and warm sensations and then this tiny being, waxy, crying, arms stretched up to the sky, was placed on my chest. I cried. She cried. I touched her and she was warm. Jeff stood up to cut her cord, and I cried again, knowing it was something that he'd always wanted to do. The small, crying thing was whisked away from me, to a warmer. I remember looking at my hands and seeing some of the blood and wax that had covered my baby. Seeing that made everything real. I cried again. I remember feeling like someone had inserted an arm into me and push and pull at my insides. My doctor peeked over my legs and said something to the effect of, "She's laying transverse and we can't turn her. We have to do a C-section, is that OK, Andrea?" At that point, I just wanted little Ellie to be safe and in my arms, so I agreed. And no sooner had the word, "OK" left my lips, a whirlwind of activity filled the room. A blue sheet went up, blocking my view of anything past my ribs, and new eyes and blue masks introduced themselves to me. One of the kind, blue masks said that he was there to take care of me and make sure I was comfortable. I wasn't anxious or distressed at all. Not anxious or distressed, that is, until I could feel something sharp poking my midsection. "I can feel that ... I'm really feeling that," I said in the loudest voice I could find. "You can feel that?" a blue mask asked me. "You feel that poking? How about now?" "Yes, I can feel that," I said. I saw yet another blue mask doing something to my IV. There was a pause and then I felt more poking. "I can still feel that," I said, loud and clear so that they wouldn't start the procedure just yet. "She can still feel that," one blue mask said to another. "OK, we'll take care of that." The mask with the kind, older eyes said, "I'm just going to give you a bit of oxygen" and a plastic mask was placed over my nose and mouth. "Liar," I thought to myself. "That's not oxygen, that's anesthisiaiiaisseaiiassisa ..." and I drifted to sleep. I don't remember anything else from that point on. Later today, you'll hear from Jeff Pike about how he witnessed the birth of his second daughter, and then there was a flurry in the operating room — surgeons came in and he was pushed out. And a nurse said to him, as he waited, "I'm so sorry. They're doing everything they can."